Here are magical, mystical hooks heading for Black Sheep Gathering 2013. 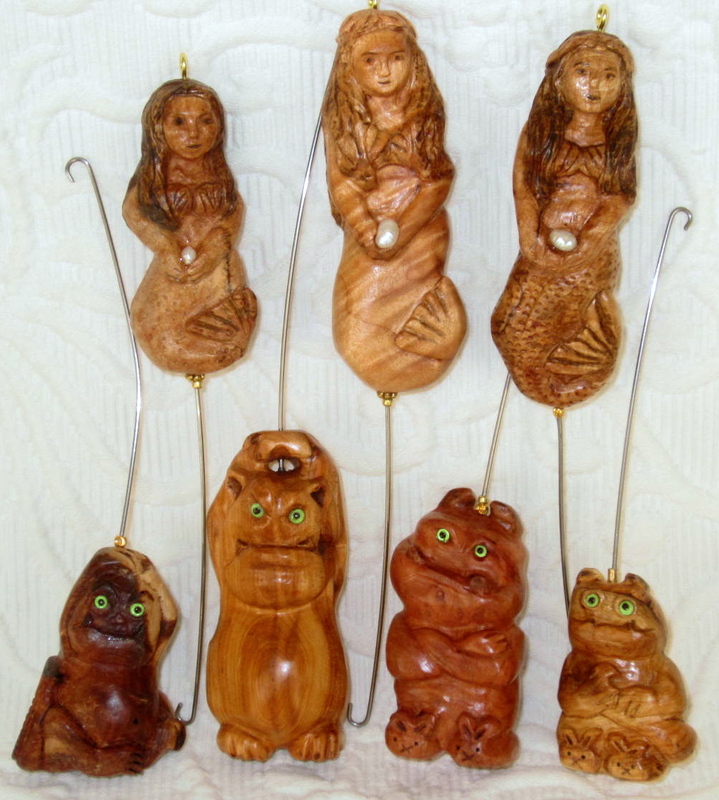 Whether you call them spinning wheel hooks, Orifice hooks, or Fetch hooks, these Mermaids & Gremlins will adorn your spinning wheel with a bit of decorative enchantment! Close up photos: scroll further down. 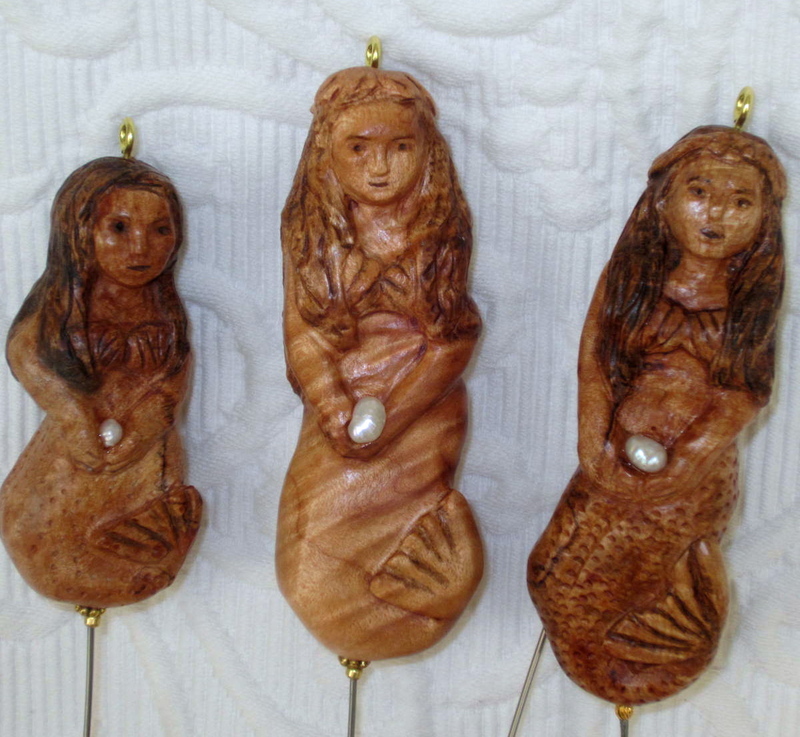 MERMAIDS carrying freshwater pearls. L-to-R: mystery wood. Curly maple. Spalted maple. GREMLINS: Thuya wood. Yew. Madrone burl. Yew. It’s quite a challenge to carve faces, especially in miniature. The Mermaids were so difficult, I’m surprised I persisted… But a special friend favors mermaids and I wanted to tempt her with a little treat. The Gremlins were vastly more amusing to make and offer total freedom in carving. We only ever think we caught a glimpse of a Gremlin….so who’s to say what they really look like? Two of these critters are cranky, with a pain-in-da-head (why IS that?). The other two wanna be growly but look adorable in their bunny slippers. Oops, the littlest fella stepped on his tail – can you tell? Each Gremlin has a devilish little pointy tail. 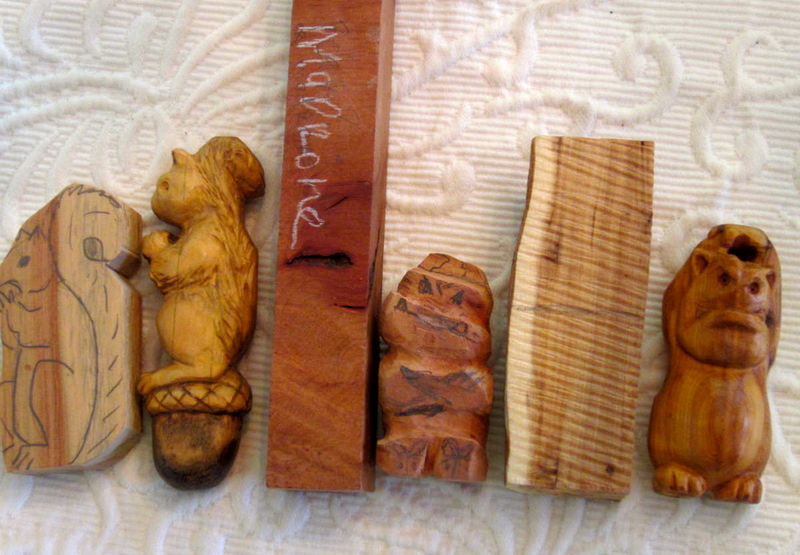 Below: wood blocks and carvings in progress, to give viewers a better idea how it all starts. I work only in small format, and need only small chunks of wood. The design is repeatedly drawn on the wood as carving occurs, removing bits at a time to reveal the desired shape. See 2 wood pieces, before carving. The squirrel chunk is ‘blocked out’ before carving begins to shape it. The center Gremlin is ‘roughed out’ with basic shaping. The Gremlin on right shows more detailed shaping & smoothing has occurred. 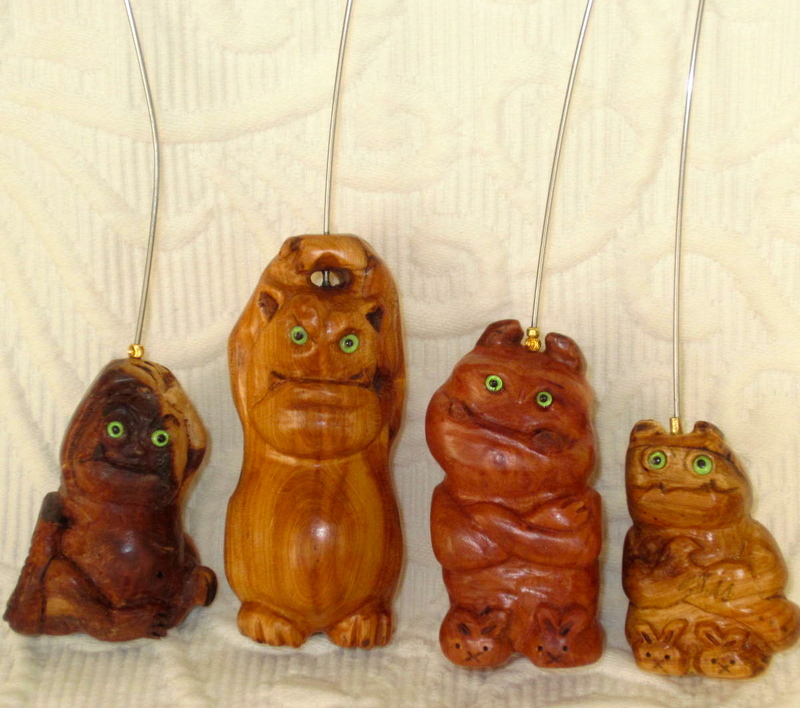 There are still multiple sandings needed to smooth the wood, + a coat of Tung oil to harden the wood & pop the grain color, + a coat of hard carnauba wax for sheen, + the final details of hook wire & glass eyes. Carvings in progress. A nearly complete SQUIRREL in Australian Cypress. GREMLIN in Madrone burl. And another GREMLIN in Yew. Note the pale outer rim of the Yew – so the Gremlins backside is pale too. More mythical critter hooks will be offered next September at Oregon Flock & Fiber Festival in Canby, OR. A Fairy hook might possible… In wood carving, anything that’s thin, or protrudes, is vulnerable to breakage. Another important factor to note when you look at the carvings: they are all meant to be a tool handle – held in the hand. So carvings must be smooth and comfortable to grip. Therefore, subjects like Moose or Dragonfly are unlikely. I worry about a Fairy having thin arms, legs & wings. Nevertheless, there are ways to creatively work around limitations. The Mermaids arms are held against her body. A Fairy could have wrap-around wings, or drape them down her back. Legs could have a leaf behind them for support. You get the idea…. ?